This roasted butternut squash soup has a smooth taste and a touch of hot chili to warm up frigid winter nights. I had a butternut squash languishing on my countertop for a couple of weeks before I decided I wanted to make a soup out of it. Homemade butternut squash soup tastes so much better than the bisque you can buy in stores. I had brought home a carton of butternut bisque soup earlier this fall and I really had to work to finish it off. It simply tasted bland and I almost convinced myself that I didn’t like butternut squash soup. But then I rediscovered this recipe in “Eating Local” by Janet Fletcher. I had a copy on my bookshelf. 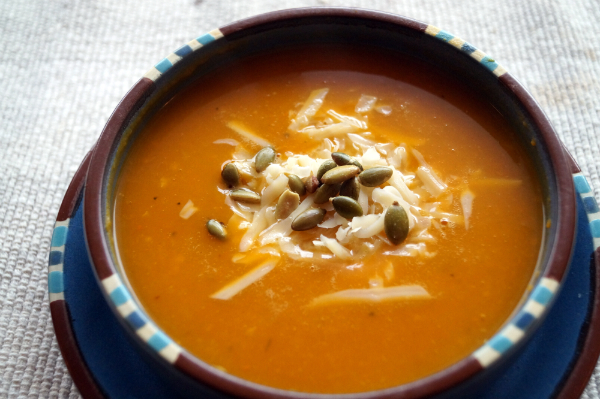 I have shared a recipe for butternut squash soup before, inspired by her recipe, but when I compared my 2010 creation with hers I saw that they were quite different. This recipe includes the heat from chilis, which gives the soup a nice kick on a cold night. I happened to have some roasted and salted pumpkin seeds in the cupboard. And instead of chili powder, I used a teaspoon of jalapeño pepper sauce I had on hand. I think you could substitute whatever heat seasoning you prefer. Just be sure to taste it as you go! Janet’s method for roasting the squash is really easy – the roasted flesh comes out of the protective skin with no struggle. Just be sure to let it cool a bit after you remove it from the oven to protect your fingers. Roasted butternut squash that has been pureed yields a lovely pillowy texture. I used an immersion blender and kept everything in the same pot. I gave a bowl to a friend who swallowed one spoonful and asked if there was cream in it. There isn’t – but that should give you an idea about how smooth this soup is. It could easily be made vegetarian with vegetable stock, just be sure to taste and add enough salt for seasoning. 1. Preheat oven to 375 degrees F. With a cleaver or heavy chef’s knife, cut off the stem end of the squash, then cut the squash into 8 roughly equal pieces. Discard the stringy matter and seeds in the seed cavity. Using 1 tablespoon of the oil, grease a baking dish just large enough to the squash in a single layer. Put the squash in the baking dish, cut side down. Cover with aluminum foil and bake until tender when pierced, 45 to 50 minutes. Cool completely, then scrape the flesh away from then skin with a spoon. 2. Heat the remains 2 tablespoons olive oil in a large pot over moderately low heat. Add the onion and sauté until softened, about 10 minutes. Add the garlic and chile powder and sauté for 1 minute to release the garlic fragrance. 3. Add the squash flesh and the broth to the pot. Bring to a simmer, stirring. Adjust the heat to maintain a gentle simmer and cook for 5 minutes to blend the flavors. 4. Let the soup cool slightly, then puree in a blender or food processor, in batches if necessary, or use an immersion blender. Return to a clean pot, if removed to blend. If the soup is too thick for your taste, thin with additional broth. Season with salt and chile. 5. Reheat the soup to serve. 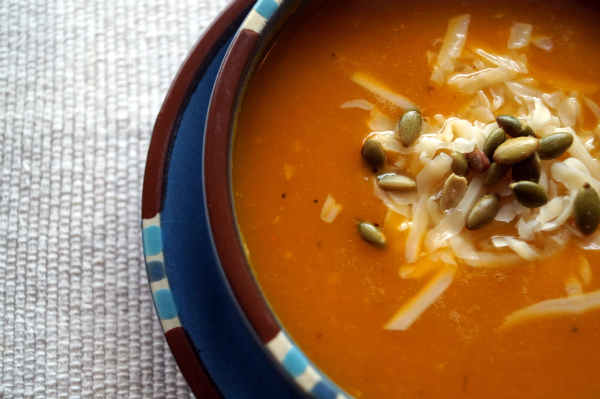 Divide among warmed soup bowls, and garnish each portion with the cheese, pumpkin seeds, and cilantro. Serve immediately.